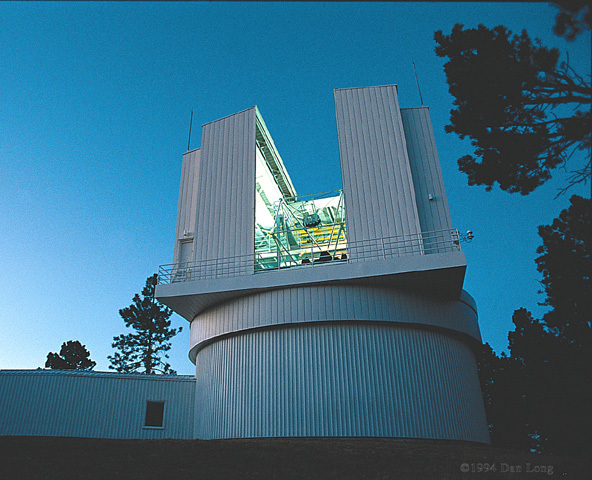 APOLLO (the Apache Point Observatory Lunar Laser-ranging Operation) is a new initiative in lunar laser ranging (LLR), that utilizes the 3.5 meter telescope at Apache Point in southern New Mexico. The large aperture of the telescope in combination with the good atmospheric "seeing" at the site has launched us into the regime of recording multiple returned laser photons per pulsein contrast to the 0.01 photon-per-pulse average experienced by previous LLR facilities. APOLLO measures the round-trip travel time of laser pulses bounced off the lunar retroreflectors to a precision of a few picoseconds, corresponding to about one millimeter of precision in range to the moon. Using this information, we will be able to gauge the relative acceleration of the earth and moon toward the sun (like a modern-day Leaning Tower of Pisa experiment) in order to ascertain the free-fall properties of earth's gravitational self-energy. Einstein's Equivalence Principle, upon which General Relativity rests, claims that all forms of mass-energy experience the same acceleration in response to an external gravitational force. This is to say that the inertial mass and gravitational mass are equivalent for any form of mass and/or energy. This is very difficult to verify for gravitational energy itself, because laboratory masses have no appreciable gravitational binding energy. One needs bodies as large as the earth to have any measurable self-energy content. Even then, the self-energy contribution to Earth's total mass-energy is less than one part-per-billion. LLR also provides the best test of the constancy of Newton's gravitational constant, G, currently limited to a variation of less than a part in 1012 per year. Relativistic geodetic precession is also best probed (currently) by LLR, now verified at the 0.35% level of precision. And the list goes on: LLR provides the best test of the motional influence on gravitational attraction (called gravitomagnetism) at the 0.1% level, and also sets the most stringent limits on deviations from the expected 1/r2 law of gravity. See this review article for more information on the motivations behind LLR and some related issues. Millimeter Precision Measurements?! From where to where? 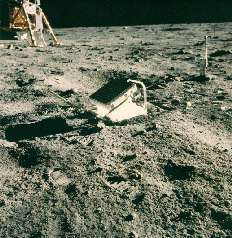 The points of reference for the earth-moon measurement are the earth-based telescopein this case, the 3.5 meter telescope at Apache Point, and in particular, the intersection of the telescope mount axesand the small, suitcase-sized retroreflector array placed on the lunar surface by Apollo astronauts (pictured is the Apollo 11 reflector at Tranquility Base). A total of four lunar retroreflectors are functional: three Apollo reflectors from Apollo 11, 14, and 15 (three times bigger than 11 & 14), and one French-built, Soviet landed (unmanned) unit from the Luna 21 mission. A significant part of the challenge of lunar range modeling is converting this point-to-point measurement into a distance between the center-of-mass of the earth and the center-of-mass of the moon. It is only after this reduction that one can consider the interesting part of the problem: the dynamics of the earth-moon-sun system. For more general information on the technique, see this description of how the technique works and why we're performing this experiment. APOLLO continues to set records, run after run. See the observing-run highlights page and the monthly yield summaries for more. APOLLO has seen it's own reflection! First Ranging Results include 2,400 return photons in 30 minutes, and confirmed accuracy at the inch-level (sort-of). 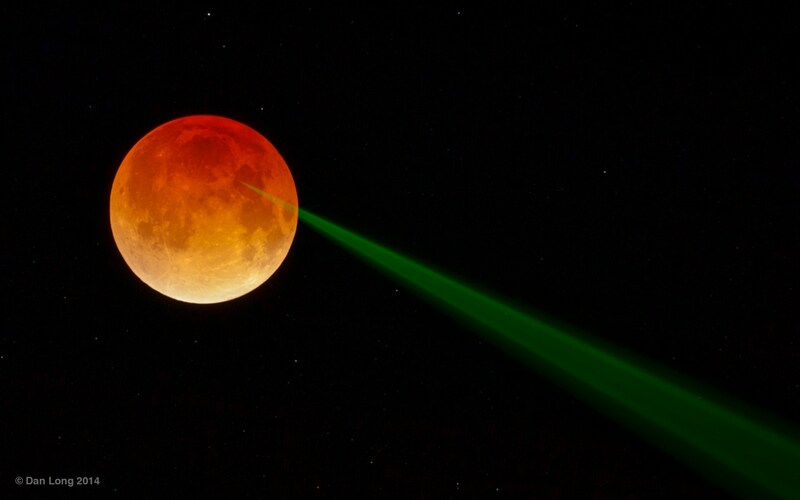 APOLLO began shooting its laser at the moon in July 2005. See pictures of the laser beam!! Take a virtual tour of APOLLO to see the layout of the equipment. Review Article (PDF; 12 MB) describing the scienctific motivations, technique, history, modeling, and future prospects of LLR. Published in Reports on Progress in Physics, 76, 076901, (2013). Instrument Paper (PDF; 412 kB) detailing the as-constructed design of the apparatus. Published in PASP, 120, 20 (2008). APOLLO overview (PDF; 132 kB) as it appears in the conference proceedings of the 12th International Workshop on Laser Ranging, held in Matera, Italy, 13-17 November 2000. This paper is the most general APOLLO paper, and serves as a good introduction. System description (PDF; 435 kB), a modified version of the paper in the conference proceedings of the 13th International Workshop on Laser Ranging, held in Washington D. C., October 2002. This paper describes at some depth the multiplexed timing scheme employed in APOLLO. Improving LLR Tests of Gravitational Theory, Williams, Turyshev, & Murphy, International Journal of Modern Physics D, Vol. 13, No. 3 (2004) 567-582. This paper describes the science attainable by APOLLO, as well as some of the model advances required. In addition, a number of graduate and undergraduate students have been involved with APOLLO: Jana Strasburg (now Dr. Jana! ), Tristan Hromnik, Jonathan Driscoll, Jesse Angle, Evan Million, Daniel Miller, Laura Tom, Charlie Barnhart, Matias Duran-Matute, Matt Stiglianese, Justin Ryser, and Laura Bodine. APOLLO has benefited from the professional expertise of: Larry Carey, Peter Doherty, Erik Swanson, Sterling Fisher, Tim van Wechel, Allan Myers, Mark Klaene, Russell Owen, and Jeff Morgan. We are also tremendously grateful to our collaborators (Bernard Kosicki, Brian Aull, and Bob Reich) at MIT Lincoln Labs for the very productive access they have provided to their detector technology. Finally, we thank NASA for supporting APOLLO and enabling it to get "off the ground", and more recently, a joint effort by NASA and the National Science Foundation to fund APOLLO at a level that will allow project completion and production of the first science results.